Red Bull driver Mark Webber says the team's new car is struggling for pace and that changes have already been made for this week's test in Bahrain. 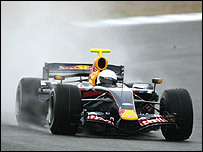 This year's car is the first Red Bull Formula One machine by leading designer Adrian Newey, formerly of McLaren. "Both David (Coulthard) and I had a bit to say when we first drove the car," said the Australian, who is struggling to fit the car. "The changes came from driver feedback and Adrian watching the car on track." Red Bull have produced a new seat in an attempt to make Webber, who is more than 6ft tall, fit into the car properly. Tall drivers have often had trouble fitting into cars designed by Newey - the designer's unwillingness to compromise in the quest for aerodynamic perfection often leads to cars that are very tightly packaged. "I would definitely like to be more comfortable. 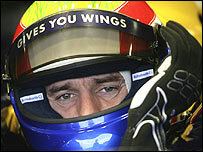 I would not have liked to race the way the seat was," Webber told Melbourne's Herald Sun newspaper. "It seems a lot better now. We've done a new seat and flattened things to get me into the car better. "We're trying to get me comfortable- the car is pretty tight in places." Red Bull's testing so far has also been beset by technical problems, although Coulthard did set the fastest time on the last day of last week's test in Barcelona. Red Bull will be joined by most of the other leading F1 teams in Bahrain, where the teams start work on Thursday.